I'm trying out Feed2Podcast which uses text to speech technology to render your post as a podcast. Unfortunately, it doesn't actually work. I'll leave the buttons up on my blog for a while to see if they fix it. Ken Yarmosh, editor of the Web Technologies hub at Corante, has aggregated the predictions of other hub contributors to provide an overview of what the hub's hive mind sees for 2006. Have a look. A major blog search property will be bought by GYM. The tide of blogs has been steadily rising, however the offerings from major portals (Google BlogSearch, Yahoo's integration of blog search with news and Microsoft's no-show) have really demonstrated a clear lack of strategy. Early in the year it will be recognized that the rate of blog posts is close to leveling off, the blogosphere will refine itself accordingly, resulting in an increase in pushing more variations of various forms of online personal media (e.g. riffs.com). The hype around blogs will be translated into hype around all online personal media/open content/microcontent and the market for mining this data will explode. There will be many business relationships formed between content hosts and mining or services oriented businesses. Aggregators will start to draw value from structured blogging and microformats. Paul Kedrosky, in other words, will be proved wrong. Bloglines will melt down, lose its first mover advantage and disappear. I'm not just saying that due to recent pain, but based on the observation that Ask has shown zero interest in nurturing this property. Why? I have no idea. 2006 will be a huge year for geocoding, resulting in some form of map visualization presented very high up in the search results stack. There will be more take up of enabling technologies which link the physical world to the online world (think GPS digital cameras, blogging from GPS enabled hand-held devices). 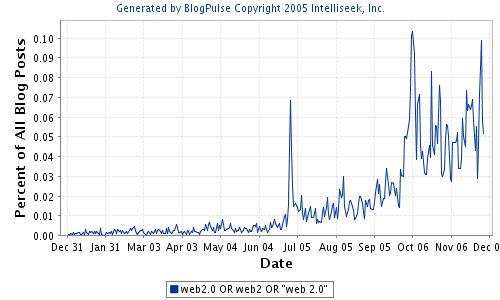 Percentage of blogs mentioning web 2.0 for the year 2005. 2006 is going to be the year of web 2.0.